See the Multibranch documentation for more information. There are a number of ways to rerun or restart a completed Pipeline. See the Replay documentation for more information. You can restart any completed Declarative Pipeline from any top-level stage which ran in that Pipeline. This allows you to rerun a Pipeline from a stage which failed due to transient or environmental considerations, for example. All inputs to the Pipeline will be the same. This includes SCM information, build parameters, and the contents of any stash step calls in the original Pipeline, if specified. No additional configuration is needed in the Jenkinsfile to allow you to restart stages in your Declarative Pipelines. This is an inherent part of Declarative Pipelines and is available automatically. 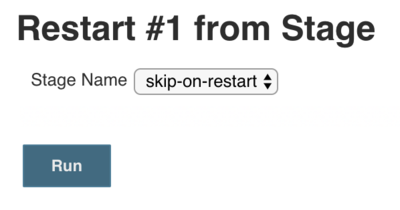 Once your Pipeline has completed, whether it succeeds or fails, you can go to the side panel for the run in the classic UI and click on "Restart from Stage". You will be prompted to choose from a list of top-level stages that were executed in the original run, in the order they were executed. Stages which were skipped due to an earlier failure will not be available to be restarted, but stages which were skipped due to a when condition not being satisfied will be available. The parent stage for a group of parallel stages, or a group of nested stages to be run sequentially will also not be available - only top-level stages are allowed. Once you choose a stage to restart from and click submit, a new build, with a new build number, will be started. All stages before the selected stage will be skipped, and the Pipeline will start executing at the selected stage. From that point on, the Pipeline will run as normal. Restarting stages can also be done in the Blue Ocean UI. 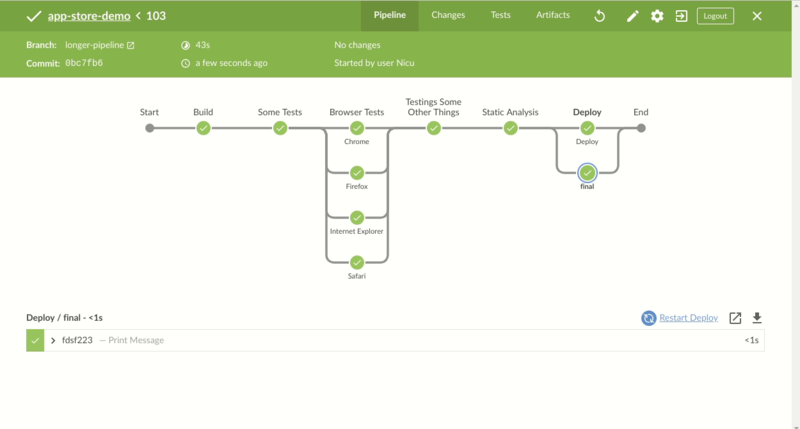 Once your Pipeline has completed, whether it succeeds or fails, you can click on the node which represents the stage. You can then click on the Restart link for that stage. Normally, when you run the stash step in your Pipeline, the resulting stash of artifacts is cleared when the Pipeline completes, regardless of the result of the Pipeline. Since stash artifacts aren’t accessible outside of the Pipeline run that created them, this has not created any limitations on usage. But with Declarative stage restarting, you may want to be able to unstash artifacts from a stage which ran before the stage you’re restarting from. To enable this, there is a job property that allows you to configure a maximum number of completed runs whose stash artifacts should be preserved for reuse in a restarted run. You can specify anywhere from 1 to 50 as the number of runs to preserve. 1 The default number of runs to preserve is 1, just the most recent completed build. 2 If a number for buildCount outside of the range of 1 to 50 is specified, the Pipeline will fail with a validation error. When a Pipeline completes, it will check to see if any previously completed runs should have their stash artifacts cleared.